Although hybrids have demonstrated great potential in enhancing the sensitivity of existing mutation detection strategies, their conventional use in diagnostic laborato ries has failed to fully materialize. This is due primarily to the time required for the fusion protocol to yield sufficient genetic material for use in molecular or cytogenetic assays and the high cost of the procedure. 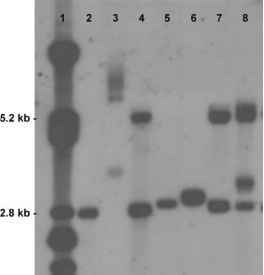 The HNPCC case described above required almost a year for the generation of sufficient DNA from hybrids for Southern blotting and PCR, which included two independent blood draws from the donor after the first fusion attempt failed. Cell culture is itself an expensive practice, and both the need to culture a large number of fusion clones to ensure the capture of each chromosome of interest and the duration of culture needed to amplify a hybrid from a single cell greatly increase the cost of this technique. The development of specific selection techniques would allow the direct capture of every human chromosome and reduce the total number of hybrids that are collected and analyzed, but this technique will always be somewhat hindered by biological limitations of cell culture. Because the genetic material from hybrids is destined for molecular or cytogenetic analyses, there is always some concern that cross-reactivity of human PCR primers or cytogenetic probes with recipient DNA could complicate the interpretation of diagnostic results. The human MSH2 probe hybridized to the blot in Fig. 3 demonstrates specific hybridization to a fragment of 10.7 kb from the mouse recipient cells, which corresponds to the fragment containing exons 1 and 2 in humans. Because the MSH2 allele in lane 3 presents with a new restriction fragment due to the deletion of exons 1 and 2, the 10.7-kb fragment corresponding to those sequences should be missing, clearly confirming their deletion. However, because the human probe cross-hybridizes with the murine genomic DNA in this area, confirmation of the deletion had to be conducted using highly specific PCR primers, as shown in Fig. 3B and C.
Matsui et al. have evaluated the cross-hybridization of human spectral karyotyping probes to mouse chromosomes, and although no specific hybridization was observed, they noted a weak, generalized background of staining over the mouse material. Consequently, further evaluation of cross-reactivity between cytogenetic and molecular probes and both mouse and hamster genetic materials is suggested. The use of recipient-only controls in all diagnostic assays is a must. Additionally, the possibility of interspecies chromosomal rearrangements in hybrids and the subsequent effects on results from diagnostic assays must also be considered in each case.